Dreamstime.com Carries Photos of Toronto's Festival of India! ~ The Toronto Hare Krishna Temple! Dreamstime.com Carries Photos of Toronto's Festival of India! How's this for proof that Toronto's Hare Krishna community is visually beautiful? 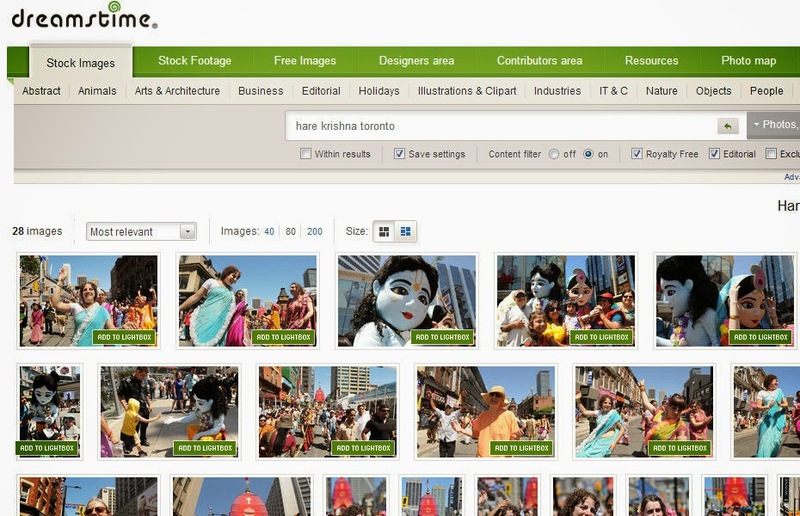 A quick search on Dreamstime (www.dreamstime.com) shows that pictures from our most recent Festival of India (Ratha-Yatra) have been placed on their website for use for graphic designers! Dreamstime is one of the world leaders in stock photography and a reliable supplier of high quality digital images. Online since 2000 as a Royalty-Free stock photography website, Dreamstime has evolved into a powerful and active community-based site. Their database is renewed with thousands of fresh images and titles on a daily basis. Check out the images that show up by clicking here!